To prepare all students to be productive members of a global society and to have children leave this school with a sense of self-worth, respect for all people and a zeal for lifelong learning. Choice is the essence of Corridor—not only the choice to be here but also opportunities throughout the day for students to choose how they will accomplish mastery of a certain skill. Students commit their mornings to reaching their highest academic potential and then engage in an extensive afternoon elective program. Here, teacher strengths and expertise are utilized to create a variety of curriculum enrichment classes that are designed to help students discover and develop talents, interests and self-esteem. 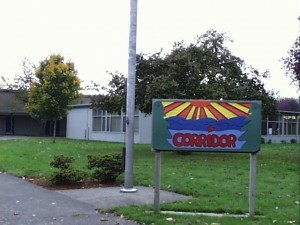 Distinctive characteristics of Corridor School include a high degree of all-staff collaboration, multi-aged grouping in the electives program, numerous field trips and other hands-on learning experiences, the annual musical production at the Hult Center, a sense of family and community that builds self-esteem, mutual respect and parent involvement in their children’s education.